In the Horsley Park Storm Chase article, paragraph three describes a storm that had developed around Wiseman's Ferry at about 2pm and affected the Gosford area from 3pm summer time onwards. 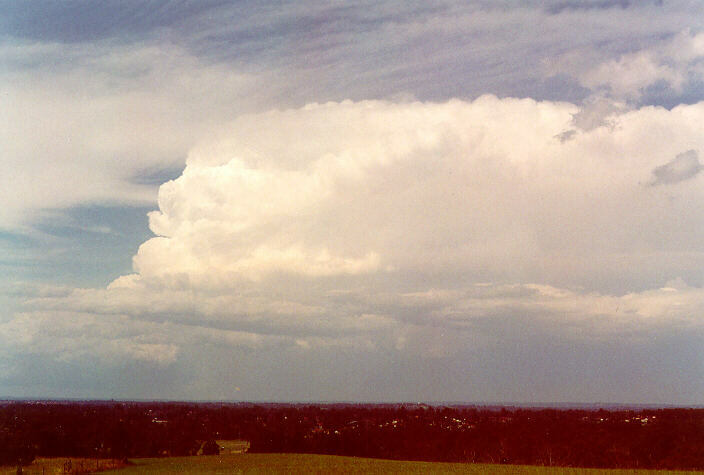 While waiting on the top of Rooty Hill, Jimmy and I observed and photographed the storm, 60 km to the NNE. 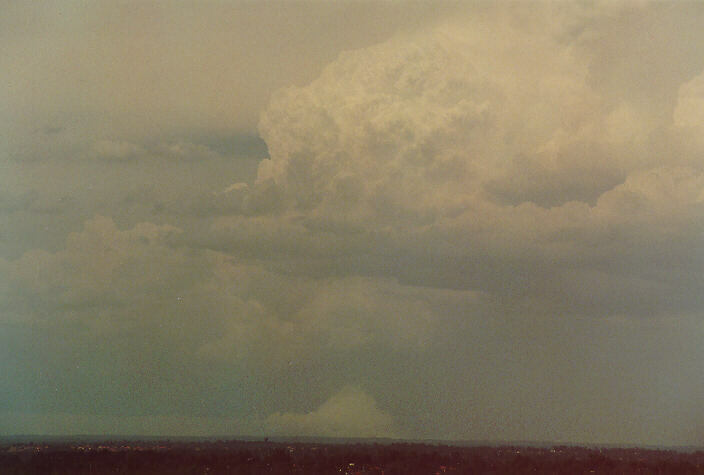 A zoomed image of the supercell's rear section. It would have been interesting to see if there was any circulation in this region. Some storm spotter reports received just prior to completion of the Horsley article, noted large hail accompanied by strong winds, that caused extensive damage, particularly to car yards. The worst affected areas from 3 to 4 p.m. centred around Gosford with golf ball sized hail recorded at Kariong, Tuggerah, Ourimbah, West Gosford and Wyong. Trees were brought down and flash flooding affected some parts. Radar imagery obtained from the NSW Bureau of Meteorology confirms that the storm was a supercell thunderstorm. The radar reflectivity shows that the storm reached 20 km in height with high reflectivity extending 16 km into the atmosphere at 4:00 p.m. Two features described below are characteristics of supercell thunderstorms. The side radar view at 4 p.m. shows a Weak Echo Region (WER). This is a radar term for a region of relatively weak reflectivity at low levels on the inflow side of a thunderstorm echo, topped by stronger reflectivity in the form of an echo overhang directly above it. The WER is a sign of a strong updraught on the inflow side of a storm, within which precipitation is held aloft. The plan (overhead) radar view from 3 to 4 p.m. all show a V-notch. This is a radar reflectivity signature seen as a V-shaped notch in the downwind part of a thunderstorm echo. The V-notch often is seen on supercells, and is thought to be a sign of diverging flow around the main storm updraught (and hence a very strong updraught).